A woman holds up a sign at a vigil for the victims of Wednesday's attack, at Trafalgar Square in London, March 23, 2017. The Islamic State group has claimed responsibility for an attack by a man who plowed an SUV into pedestrians and then stabbed a police officer to death. London police on Thursday identified the attacker who killed four people near Parliament as Khalid Masood, a Briton who converted to Islam and had a lengthy criminal record for weapons possession and other charges. Islamic State said Masood, 52, was a "soldier" of the extremist group who responded to its call to attack civilians and the military in countries allied with the United States in battling IS. Masood had never been convicted of terrorist offenses, but British security officials said he had been investigated in the past "in relation to concerns about violent extremism." Authorities said they thought he was acting alone Wednesday when he ran down pedestrians on Westminster Bridge, a Thames River crossing leading to the Houses of Parliament, crashed his rented vehicle into a gate and fatally stabbed a policeman who tried to stop him. Armed police shot and killed Masood moments later. People light candles at a vigil for the victims of Wednesday's attack, at Trafalgar Square in London, March 23, 2017. In the hours after the attack, police conducted raids around the country in search of anyone who might have given support to Masood. Eight men and women were arrested Thursday on suspicion of planning terrorist acts. The dead assailant, who was older than most Islamist attackers involved in recent spectacular terror attacks in Europe, had been a teacher of English and was known as a fanatical bodybuilder. One of the civilians who was run down on the bridge, a 75-year-old man, died Thursday in a hospital, raising the casualty toll to four victims and Masood. Although IS claimed responsibility for the attack, a statement posted online did not implicate the group in the planning or execution of the attack. An Italian tourist who witnessed the carnage told reporters he saw Masood attack the policeman with two knives. "He gave [the officer] around 10 stabs in the back," the visitor said. 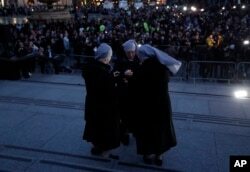 A group of nuns light candles at a vigil for the victims of Wednesday's attack, at Trafalgar Square in London, March 23, 2017. Mayor Sadiq Khan called for Londoners to attend the vigil in solidarity with the victims and their families and to show that London remains united. Valiant efforts to resuscitate Constable Keith Palmer at the scene failed. The 48-year-old officer was a 15-year police veteran. One American was among the dead: Kurt Cochran, 54, of Utah, who was in London with his wife to celebrate their 25th wedding anniversary. His wife, Melissa, was among the 30 people injured. 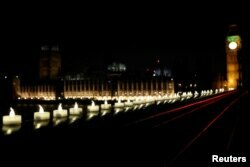 Masood's vehicle hit the Cochrans as they crossed Westminster Bridge. The remaining victim of the attack was a British school administrator, Aysha Frade, 43. Candles burn on Westminster Bridge the day after an attack in London, March 23, 2017. Mourners gathered in London's Trafalgar Square on Thursday evening, about one kilometer from the crime scene, for a candlelight vigil. The mayor of London, Sadiq Khan, told the crowd of thousands that "those trying to destroy our shared way of life will never succeed." Khan said the vigil in the most recognizable public plaza in London was meant to honor the dead and injured, but also "to send a clear, clear message: Londoners will never be cowed by terrorism." Mark Rowley, head of counterterrorism efforts for London's Metropolitan Police Service, said the eight people arrested Thursday were picked up during searches at six separate locations, and that investigations were continuing in London, Birmingham and other parts of England. He declined to say whether or how those detained were involved in Wednesday's attack. "It is still our belief, which continues to be borne out by our investigation, that this attacker acted alone and was inspired by international terrorism," Rowley told reporters. Prime Minister Theresa May struck a defiant tone in discussing the attack Thursday before Parliament, telling British lawmakers that what London experienced was "an attack on free people everywhere." "Yesterday, an act of terrorism tried to silence our democracy, but today, we meet as normal, as generations have done before us and as future generations will continue to do, to deliver a simple message: We are not afraid and our resolve will never waver in the face of terrorism," she said. May thanked Britain's friends and allies around the world "who have made it clear that they stand with us at this time." She said the victims included nationals of France, Romania, South Korea, Germany, Poland, Ireland, China, Italy and Greece, as well as the United States. The U.N. Security Council in New York, chaired by British Foreign Minister Boris Johnson, observed a moment of silence Thursday for the London victims. 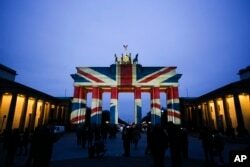 The Brandenburg Gate is illuminated with the British national flag to pay tribute to the victims of an attack in London, at the German capital in Berlin, March 23, 2017. "You may know that today there are victims in London from 11 nations, which goes to show that an attack on London is an attack on the world," Johnson said. "I can tell you from my talks here in the United States with the U.S. government and with partners from around the world that the world is uniting to defeat the people who launched this attack and defeat their bankrupt and odious ideology." 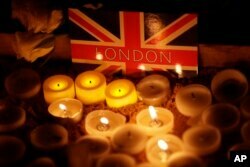 In London, Parliament's session began with a minute of silence Thursday. Police officers stood in silence nearby outside the headquarters of the city's Metropolitan Police.